My Name is Khan, the polished new venture of Karan Johar, is a sugarpuff film. It is very sweet, very earnest and, maybe in spite of or because of this, lovable. It also reunites the dynamite duo of Kajol and Shah Rukh Khan - those quirky, jittery fuzzies who made the 1990s such heady, halcyon days. Ahh, yes. It is also charming enough that we can forgive SRK for the pain he brought us back in 2008, and we are now back on the SRK train. Ahh, to look forward to something... and be rewarded! What a nice feeling. The film's first act follows the standard TV-movie "Disease of the Week" narrative arc: there is a brief prologue showing Rizwan Khan (Tanay Chheda, of Slumdog Millionaire), a young boy with Asperger's syndrome, facing ridicule, misunderstandings and other difficultes - and, thanks to his courage, as well as his wise, gentle mother's (Zarina Wahab) shelter, his eventual triumph. There is his maturation into a Rain Man-esque Shah Rukh Khan, and his move from India to San Francisco. There, he meets and courts the lovely Mandira (Kajol), a hairdresser and single mother. Mandira's charismatic tween son, Sameer (Yuvaan Makaar), eventually accepts Rizwan as friend and father figure, the adults marry, and the three form a happy, glowing family. This act is easy-going and lovable; it conquered us with little difficulty. It is, however, the second act which is The Point of My Name is Khan, and here things falter and wander. 9/11 happens, anti-Islamic paranoia spreads, and an indirectly-related tragedy destroys the warm, fuzzy glow of the first act. The Point, which is helpfully explained by Rizwan's mother early in the film, is that the only true difference between people is whether they are good people or bad people - not whether they are Muslims or Hindus, Iraqis or Americans. Rizwan later repeats this phrase in the charming courtship of the first act when, introducing himself as a door-to-door soap salesman, he also appends, "I am a good person and I do good work." Rizwan's moral certitude is shaken by the second act, when he is suddenly profiled as a villain by strangers and loved ones alike, and his assurances of his own moral goodness begin to take on a more desperate air: "My name is Khan... and I am not a terrorist!" This becomes his mantra and, following the shake-up and break-up of his San Francisco shelter, he embarks on a cross-country trek to tell the President (and, in a way, the State), that he is, and has always been, a good person who does good things. Along the way, he has a variety of adventures which, as Don King would say, can happen only in America! Or post-9/11 America, that is. In particular, there are references to Hurricane Katrina (and the government's failure to manage the disaster) as well as Guantanamo. These are touchy subjects, but they are handled with a simple earnest "Humanity is good! Rizwan is good!" vibe, so we fly safe through. Much of the movie's charm comes from the simplicity of its storytelling, its optimistic (secular-ish) humanism, and its depiction of sparkly joy. It is shamelessly manipulative, like a Disney film. But its moral message is also just as child-like and shiny as a Disney film's. People are good! Prejudice is bad! We laughed and cried throughout the film, and one of its most poignant moments was the montage of Happy Family Moments, where the Hindu Mandira does morning pooja while her husband does the salaat. We've never considered SRK a particularly skilfull actor from a technical standpoint, but we've always admired his immense charisma as a performer. In My Name is Khan, SRK flexes a bit more acting muscle and generally does justice to his character's Asperger's syndrome. Or, at least, does justice to previous cinematic portrayals of autism. The best we can say is that he is no worse than Dustin Hoffman or our beloved Anil Kapoor (and, no, we will never stop finding ways to link to that song) - and that is, well, saying something. His chemistry with Kajol is just the same as it ever was - they seem like old friends reunited, entirely comfortable and at ease in their on-screen banter. Their courtship is the film's sugary icing. Unfortunately, Kajol's role is halved after intermission, and her character starts exhibiting schizophrenic changes in personality. Kajol is a strong enough actress to make this weak characterization not seem totally rubbish (even though it does push the envelope of the absurd). Other unexpected faces do well in their parts - Vinay Pathak as a silly motel owner was great. Thematically, the movie is a child's plea for peace. It doesn't acknowledge the ambiguity of real life, the politicization of fear, instead leaving everything blunt and sharply defined. This is a world where grumpy tram-goers will heckle a man as a "freak!" until they are morally chided, when they will shuffle away shame-faced. Does this really happen? Anywhere?! But that's OK, The Lion King is also pretty straightforward - and it's magnificent! My Name is Khan is not magnificent, but it is awfully nice. Like candy! Wow, PPCC, you actually liked it. 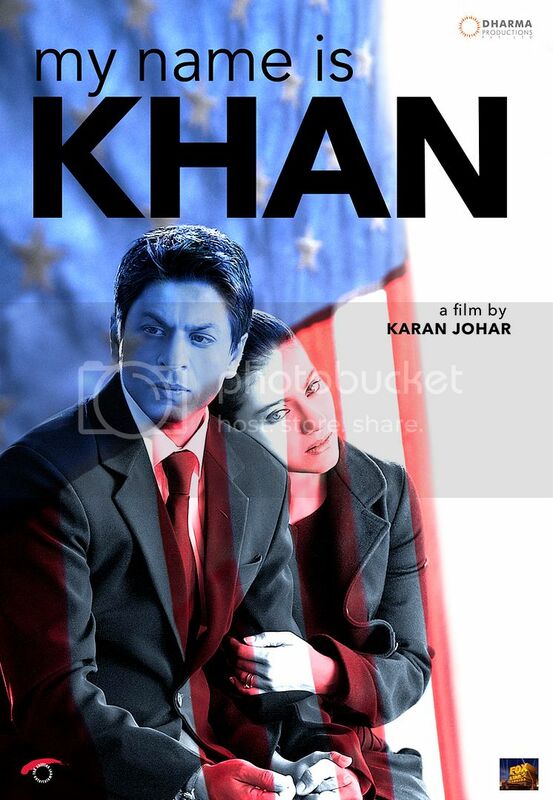 I think that MNIK didn't need an overly politicized message. Sometimes it's nice to watch a film, where "there are only two kinds of pepole in the world: good people do good deeds, bad people do bad deeds". The simple message, that MNIK conveys got across, in spite of the obvious flaws in the second half. I do think that if the 1st half was a stand-alone, it would've been Karan's best. I agree with Anishok - I saw MNIK last night, enjoyed the whole experience of my first Hindi film on the big screen, but have been thinking about it and the more I think about it, the more it can do without the grander "message" part. It was the little details, the interpersonal things that got to me - Khan and how he related and impacted on his family and neighbours, and I think that held the message KJo wanted to get across, he was just nervous it might not achieve it, so he went LARGE SCALE. And I wish he hadn't. Well PPCC you and I can sit in the "We Likes MNIK Lounge" and chat about why Kajol the Monobrow would be allowed to be Kajol the Beautician? I agree the second half went a bit off the rails, but really with a few tweaks could still have been excellent. SRK was brilliant and endearing and according to a psychologist friend quite reasonable in terms of the Aspergers. Overall, I cringed a lot less than I had expected to. I loved the wedding night scene, and am sure Kajol looked as surprised as the audience did at his assurance that it would take more than a minute! I think the acting was uniformly pretty good. I need to work on the epiglottis. Anishok - Totally agreed; first half ate the second half, in terms of skillful execution. I think I was just so relieved that this wasn't horrible (especially after Qurbaan! ), it really mellowed my review. Ness - Definitely. Goodness, when KJo tries to be political, it's not usually very pretty - and NEVER subtle. Temple - I thought he was saying "Epic Lotus" for most of the film! "How enigmatic..." I thought.